We take the stress out of Giving a Gift. Stress, Improve Health and Increase Wealth. Are you looking for handmade jewelry or a gift that is personal and has special meaning? Are you searching for one-of-a-kind custom jewelry or gift for the holidays or a special event? You have a lot of options when it comes to choosing a gift. If you, or a loved one are looking to relieve stress, improve health or increase wealth, why not choose a gift that is beautiful, has meaning and might even help you feel better? DAIKOMYO® Empowering Gems have Meaning and a Purpose. And our jewelry is customized to your needs or the needs of someone you love. So giving our handmade gemstone jewelry with intentional healing takes the stress out of your holiday shopping. You can find the perfect gift for every need. Throughout history, it has been commonly believed that gems could powerfully influence different aspects of the human body, mind and spirit. A “science” of sorts has been recorded alongside human history that suggests that when worn next to the skin, the power of the gems could help or soothe various physical, mental, emotional, spiritual and material conditions. There is no proof of this, but there is ample recorded evidence. The ancient Egyptians used lapis, carnelian and malachite to relieve stress, relieve pain and boost the immune system. The Incas used emeralds for focus and memory. The Chinese used jade to increase wealth and for success during times of change. The Native Americans used turquoise for protection, wisdom and love. Obviously, we can’t make medical claims or promises of any kind, but we’ve heard so many great stories from so many of our customers that we just have to tell you about the possibilities. To attract wealth, reduce stress and pain, attract love and harmonious relationships, lose weight, increase fertility or virility, bring clarity of purpose, create success in career, enhance focus and communication, and ease changes and transitions in life as in PMS and Menopause. How Do These Jewelry Pieces Promote Change and Healing? There are three aspects to DAIKOMYO® Empowering Gems that suggest our products can contribute to changing and healing your troubling issues. First, there is the long history of anecdotal experience in multiple cultures attributing energetic powers to gemstones. Of course, this could simply be the imagination of millions of people over many, many centuries. You have to decide that for yourself. Second, quartz crystals are powerful absorbers and transmitters of energy. They are the basis of all semiconductor manufacturing which make the microchips that power the majority of the electronics we use today. Every precious and semiprecious gemstone, from Amethyst to Diamond is classified as a quartz crystal. We only use precious and semi-precious gemstones in our DAIKOMYO® creations. Third, this jewelry is deliberately infused during its creation with additional empowering energy through a specific process that imparts calm, clarity and healing as well as many other benefits. We hear so many reports from our customers that they experience these results, that they have made us believers that our intentional process is being received. What is DAIKOMYO® Empowering Gems? DAIKOMYO® Empowering Gems is one of a kind, handmade jewelry, but it is more than simple adornment. The word “Daikomyo” means “Enlightenment” and “To heal the soul.” In addition to its cosmetic beauty, this jewelry is infused with empowering energies intended to amplify the natural healing properties which are believed to naturally reside within the gemstones. When different combinations of gems are worn together, the effects may be very subtle, yet powerful. As jewelry, these creations can become personal “power pieces,” that, over time when worn with “intention,” may help you achieve specific goals through various stages of your life. What Custom Products Do We Make? Abundance, to increase all forms of prosperity and wealth. 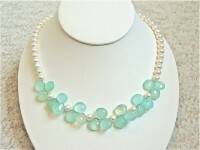 All of our pieces are created meticulously by hand with natural gemstones and/or fresh water pearls. In all cases, one piece may be available for each of the products shown on our site; however, any piece can be made to order. Because all of our jewelry is handmade with Natural Gemstones, each is unique, so no two are exactly alike. As a result, products may vary slightly from pictures shown but we make every attempt to represent the products accurately. 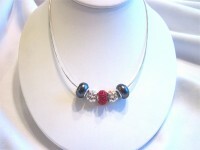 Some of the current products available include necklaces, pendants, earrings and bracelets for women and children. Gifts for men include cufflinks, keychains and sets of loose gem nuggets. Customized pieces are designed and created to address specific health, wealth and emotional needs in conjunction with wardrobe and budget. We’ll also take a piece of existing or broken jewelry and fashion it into a new treasure with a brand new look and feeling, infused with new life and energy. Sign up for our FREE REPORTto discover how gemstones work to help specific physical symptoms like relieving your pain, stress and anxiety, increasing all forms of wealth and abundance and improving your health. Shop our Product Pages.Each Page contains inventory that is dedicated to helping ease issues related to relieving stress, increasing wealth or improving health. Just follow your heart. Whatever gemstones you’re attracted to the most are exactly what your “soul,” or your “spirit’ needs the most. Take a look at the Healing Properties of Gemstones Pageif you’d like to know the benefits of each gemstone to your state of mind, your health and your wealth. Have a special piece designed to suit your specific needs.The handmade jewelry and gifts on this site are for sale and are ready to be shipped to you. If you don’t see exactly what you’re looking for, contact us at info@DAIKOMYO.com and we’ll be delighted to design and create a custom jewelry piece for you with the gemstones and healing properties you want, to suit your taste, style and budget. Contact us today to create that special, one of a kind Gift! This product is not intended to replace any licensed medical treatment. No guarantee is made towards validity and the use of gems for the statements listed is at the user’s own risk. DAIKOMYO® Empowering Gems is a Division of McKinnon & Company, 21 Robert Rd., Marblehead, MA 01945 email us at info@DAIKOMYO.com or call us at (781) 631-2193 for special orders and customized pieces. DAIKOMYO® Empowering Gems and all designs created for DAIKOMYO® Empowering Gemsare the sole property of McKinnon & Company and are registered with the U.S. Patent and Trademark Office and protected under U.S. patent and trademark law.